Robb Hoff: Cosmic Egg Rapture and Crackers For A Lycanthrope on the loose! Cosmic Egg Rapture coming to SuperCon in Louisville! Look for cosplay Sirena at the Louisville SuperCon Nov. 30-Dec. 2! She’ll have “Sirena’s Special” business cards for show goers to take advantage of discounted copies of Cosmic Egg Rapture. I’ll be at Booth N9 in ARTIST ALLEY all three days of the event with not only copies of Cosmic Egg Rapture but also a limited number of my 1990’s folk horror classic, Crackers For A Lycanthrope. 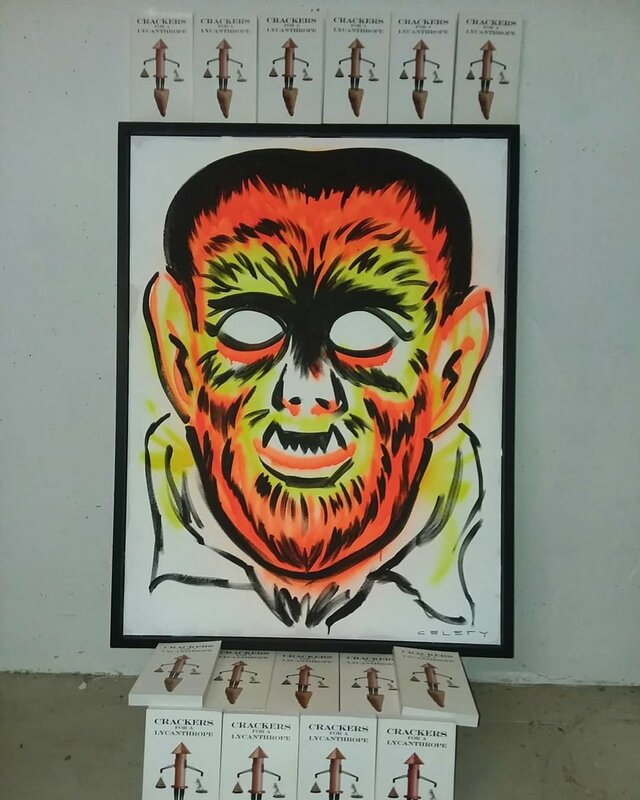 This “Wolfman” painting below marks the way to my booth! 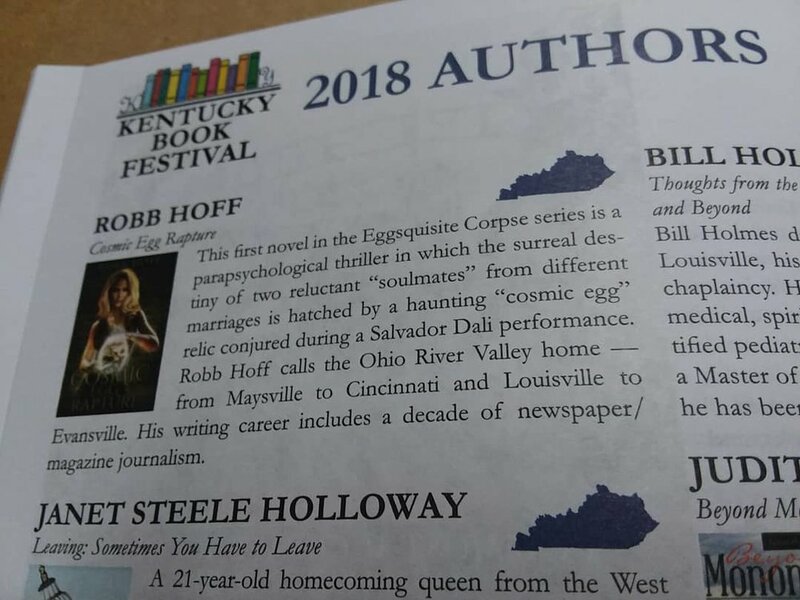 Folks who can’t make it to SuperCon can still buy signed copies of Cosmic Egg Rapture at Robb Hoff Author website store. Amazon also has copies available. Click here: Cosmic Egg Rapture. But if you prefer Kindle reading, fret not! Cosmic Egg Rapture is part of the Hydra Publications Cyber Monday $0.99 sale from Nov. 25-27. Click Cosmic Egg Rapture to order the sale-priced Kindle version directly. On a final note, I have to say I was quite honored to be invited to the 37th Annual Kentucky Book Fair in Lexington, Ky. on Nov. 16-17. The Friday night festivities and author signing event on Saturday were a blast! The Cosmic Egg Rapture book cover was featured with my bio and book synopsis in the book fair catalog. I'm pleased to be among the Hydra Publications authors who are participating in a three-day $0.99 Kindle book sale from August 1-3 on Amazon. The sale features the first books of series by Hydra authors, including my Surrealistic Cosmic Egg Rapture, the fantastic fantasy novel Virtue and Vengeance by M.A. Liguori, and the assassin thriller Defined by Mary Ellen Quire. Hydra Publications authors at the 2017 Kentucky Book Fair. (L-R) Tony Acree, Robb Hoff, and Bill Noel.